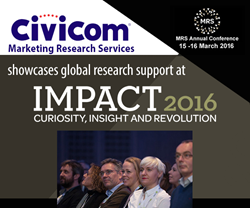 Civicom Marketing Research Services, a global leader in marketing research facilitation, will showcase its capabilities to the UK and EU marketing research community at Impact 2016, an annual conference in the UK established by the Market Research Society (MRS). The event will be held on March 15-16th at the Grange Tower Bridge Hotel in London. Civicom is eager to connect with researchers at Impact 2016 and to showcase its leading-edge suite of solutions to help catapult market researchers to client success. In combination with the Market Research Society’s 70th anniversary, Impact 2016 is themed “Curiosity, Insight, and Revolution:” Exploring the roots of the market research industry: The pursuit of “why’s” and the drive to figure out the curiosities of the human mind, the process in the discovery of insights, and the inspiration for innovation brought forth by the market research industry in diverse fields in society. Civicom Marketing Research Services will meet with prospects and clients at this year’s event, strengthening its already established commitment to Civicom clients in the UK and the EU. The Company recently established its London office serving the UK and Europe. Being part of events such as Impact 2016 aligns with Civicom Marketing Research Services’ unceasing pursuit of developing innovative technology solutions as a multi-country solutions provider of marketing research support worldwide. The company is always eager to connect with industry peers on elevating and advancing its competitive suite of services offered to marketing researchers. As a global marketing research support provider for the marketing research community, Civicom will be showcasing a wide range of telephone and web-based solutions for international market research facilitation. As the Market Research Society celebrates its 70th year, Impact 2016 showcases the research sector's burning curiosity, its talent to mine dazzling insights and its ability to ignite revolution in business and society. Impact 2016 is the leading marketing research conference in the UK for researchers who want to tap into big ideas, practical guidance and inspiring strategy. Civicom Marketing Research Services is a global innovator in qualitative research tools using the latest technology solutions for marketing research. The company works hand in hand with market research firms, facilitating projects that enable clients to achieve extensive, global reach. Civicom’s proprietary global audio and recording platforms, plus web-enabled tools, operate in virtually every country in the world. Civicom operates 24/7 every day of the year with a dedicated and trained service team of ‘CiviTechs,’ assuring clients that no matter where their project is located, Civicom will be able to facilitate it. Civicom is the global leader in facilitating telephone and web-enabled IDIs and Focus Groups using Civicom CyberFacility®. Civicom also offers Civicom Chatterbox®, an asynchronous online research platform that operates globally and is available for individual or multi-country studies, plus Civicom InSitu® Mobile Research, a qualitative tool for audio diaries and patient journeys. Additional services include Civicom FrontRow™ Mobile Ethnography, transcription services through TranscriptionWing™, and respondent recruiting through CiviSelect™. The company’s latest tool is See Me Navigate™ for assessing mobile usability, enabling researchers to view a respondent’s mobile device remotely through online technology to conduct mobile app and mobile web usability research while the respondent engages with their mobile device. Civicom operates in over 96 countries and offers extensive translation services for marketing researchers. All services are available in Spanish, as well as English, and multiple other languages.